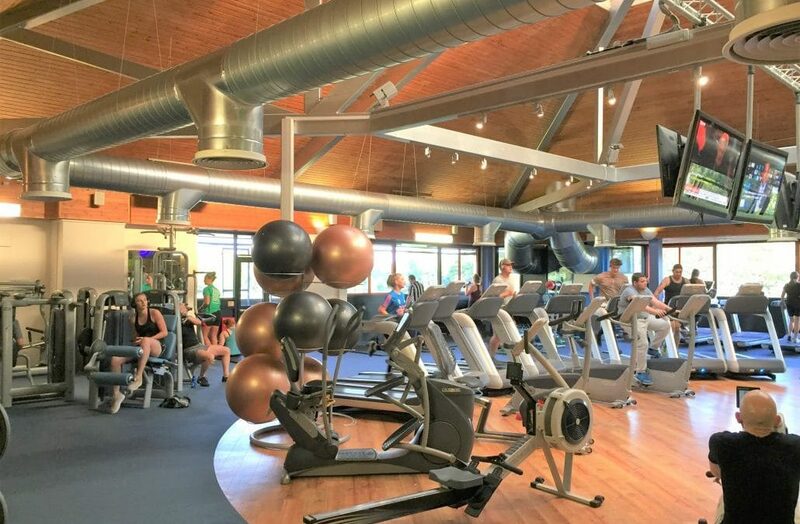 Olympiad Leisure Centre in Chippenham is one of the largest leisure and activity centres in Wiltshire, offering first class health, sport and fitness facilities. Sport and leisure centres inherently use more energy than most other operations and as part of a plan to reduce costs and become more environmentally friendly, SMARTech Heating & Cooling were asked to design an energy and cost-efficient cooling system for the centre’s gym. Gym members expect a comfortable space to exercise in. As such it is critical it is essential that the air cooling system provides the right climate throughout the year. SMARTech Heating & Cooling have considerable experience of designing and installing energy efficient cooling solutions, using evaporative cooling technology, in a range of settings including; leisure, retail, manufacturing and offices. The bespoke system designed by SMARTech Heating & Cooling was a hybrid system, integrating evaporative cooling and air-conditioning technologies into a single, PLC controlled system. This solution enables the internal climate to be optimised throughout the year, regardless of the external temperature. Working with Leisure Centre management, we were able to deliver the install programme to ensure that the gym remained operational throughout. When compared to traditional air-conditioning, our hybrid solution gives up to 90% energy saving when in standard evaporative cooling mode and c.50% when in full air-conditioning mode. Low energy variable speed EC (Electronically Commutated) fans are specified to supply and extract air. Fresh air is brought into the system through EU4 pre-filters and Munters CELdek® pads. 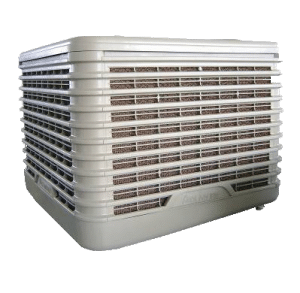 Evaporative cooling operates during warm periods to cool air. During winter periods, warm exhaust air is mixed with cold fresh air. This mixing process is described as attemperation. Patented control systems measure and control air flow rate, supply and exhaust temperature. Control systems automatically match air flow to the amount of cooling required. This is achieved by using the evaporative cooling system in ventilation mode only, therefore with no adiabatic cooling (water wetting the pads) which allows the zone to be controlled for c.50% of the year to maximise energy efficiency. This is when the evaporative cooling system is operating with the wetting of the pads to control the air conditions to the desired conditions. The evaporator has been designed as a double pass evaporator which allows the zone to only use partial AC support cooling. At this stage the evaporative coolers PLC will close the supply and extract dampers and open the recirculation damper, thus allowing the zone to be controlled in a similar strategy to the use of air conditioning in a close zone. This allows both passes of the evaporator to be used. We have specified the system with a cooling capacity of 33kW have a cooling capacity to enable the zone to be controlled, for example, at 17°c on a day with an outside temperature of 32°c. This stage enables the modulating dampers, which are controlled via the PLC, to be opened at varying degrees as required and the air from the zone is recirculated with fresh air introduced to maintain air quality as required. This method reuses the heat in the zone and the heat being generated in the zone to maintain the required room temperature where possible. If required, the system can be designed to provide a heating solution for when the room drops below a set temperature point. Our case study on SMARTech Cooling’s work with the Olympiad Leisure Centre tells the story of how we helped reduce their energy consumption. If you would like to reduce energy waste, boost profits and cut carbon emissions then contact SMARTech Cooling today. As a Carbon Trust Accredited Supplier, we can also help most business access a 10% capital grant (up to a limit of £5,000) towards the cost of energy saving projects.